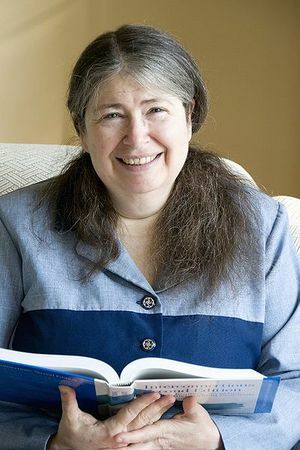 Radia Perlman (born in 1951) is a renowned computer engineer who is a Sun Fellow at Sun Labs/CTO of Sun Microsystems, Inc., specializes in network and security protocols. She is the inventor of the spanning tree algorithm used by bridges, and the mechanisms that make modern link state protocols efficient and robust. She is the author of two textbooks. Her thesis on routing in the presence of malicious failures remains the most important work in routing security. She has made contributions in diverse areas such as, in network security, credentials download, strong password protocols, analysis and redesign of IPsec's IKE protocols, PKI models, efficient certificate revocation, and distributed authorization. In routing, her contributions include making link state protocols robust and scalable, simplifying the IP multicast model, and routing with policies. Born in Portsmouth, Virgnia, she holds BA, MS and PhD degrees from MIT. This page was last edited on 24 February 2016, at 14:52.